Opinion Poll: What do you think of "Cheeni Kum"
Advertised as a “sugar free romance” Cheeni Kum – Balakrishan’s directorial debut, is not entirely without sweetness. A film to enjoy with one’s parents, it provides some light humour and ample charm but leaves no aftertaste – it’s just a little too bland. Buddhadev (Amitabh Bachchan) – a 64 year old NRI chef and confirmed bachelor, meets a vivacious 34 year old career woman from Delhi (Tabu) and they fall in love. Some of the dialogues between the couple are beautifully executed by the actors and stylishly shot. However the screenplay is inconsistent, relying too heavily on gimmicks and easy solutions so that the end product looks good but lacks flavour. In some respects stereotypes have been avoided. Bachchan’s character – Buddha, has a dry humour and crustiness that make him an interesting choice for a romantic lead. Tabu’s Nina has an intelligent, playful wit which is uncharacteristic of the love interest in Bollywood films. Although female leads in Hindi movies tend to be sweet and innocent and can even be feisty and bold, they are not generally, worldly or amusing. The coup though, is Buddha’s mother played brilliantly by Zohra Sehgal. As is often the case, it’s the life experience one brings to a viewing experience which shapes perception. Buddha’s mother with her eclectic TV viewing tastes and argumentative streak reminded me of my own rather eccentric but wonderfully warm grandmother so I really enjoyed the character. It’s just a pity that these potentially entertaining individuals aren’t given enough scope in the course of the winding 140 minute film. The gossamer thin story is stretched to breaking point and is only held together by the collective charisma of its stars. The tension in the first half of the film does not grow out of the interaction between the leads. It is grafted on by way of a sub-plot. Buddha has a friendship with a sweet child (here is the sweetness!) who is suffering from leukaemia. The little girl is of the type that is often described as having “an old head on young shoulders” and her discussions with Buddha are supposed to deepen our understanding of his fears and insecurities. This technique works initially but collapses because developments in the child’s life impinge on the relationship between Buddha and Nina; they even detract from Nina’s role in the film. At these points the story is both predictable and contrived so that the resulting emotional outpourings are just a lot of hot air. Nina’s father – Om (Paresh Rawal), who is 6 years younger than his prospective son-in-law, is also largely there as a ploy. He acts as a foil to Buddha’s character but, like the little girl, doesn’t seem to exist in his own right. Om is a buffoon whose function is to bring on laughs. However, his actions DO become pivotal to the plot; they feed into the “real” human drama that’s unfolding. But sadly – because the character is so superficial, there is nothing substantial to which the leads can respond. In many good Bollywood films songs deepen our understanding of relationships. If the song element is clipped to the point where a Bollywood film resembles a Hollywood film, then there has to be more done to enhance the story-telling technique. The screenplay needs to be stronger and the editing – tighter. Illaiyaraja’s tuneful score has been used effectively but in a film of this duration, it could have played a more significant part in fleshing out the relationship between the leads. There is an absence of physicality where the couple is concerned which makes their relationship seem almost platonic. I guess I’m a traditionalist and miss the fantasy of song picturization as means of describing the emotional terrain that lovers must navigate. It’s what drew me to Hindi movies in the first place so I feel its absence profoundly. 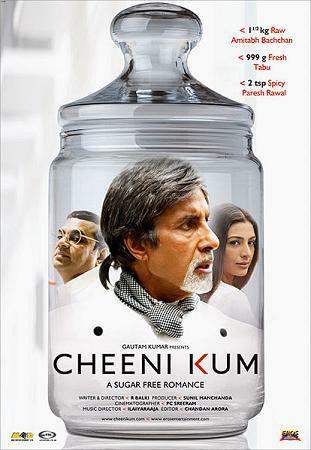 Cheeni Kum is definitely a vehicle for Amitabh Bachchan and this where the emphasis of the film is wrong. It should be a vehicle for the relationship between the characters portrayed by Tabu and Amitabh Bachchan. Other actors should not exist merely to showcase the star; they should be there to contribute to the internal logic of the narrative. As it is, they retreat alarmingly into the background as the spotlight falls yet again, upon the legend whose histrionics are not supported by clear motives and meaning.